My name is Ray Maurstad (retired Radio Officer). I was sitting in my Radio Room on the tanker SS Robert E. Hopkins that night. I was off watch and doing the ship's payroll but I had left the watch radio on instead of switching to the automatic SOS alarm. The distress signals came across very loud; loud enough so I knew that the ships in distress were not very far off. We were southbound out of Fall River Massachusetts where we had discharged our oil and we were headed back to Texas for another load. I fired up my transmitter right away and waited for the distress signals to be completed so I could reply. I quickly answered both ships telling them their distress messages had been received and told them to standby. I delivered the messages to our Captain and he immediately set a course for the collision site. We had to navigate through large fishing fleets which slowed our progress somewhat. We were the fourth ship alongside the Doria. I have both books; Collision Course and Saved. 10:20 PM ANDREA DORIA TO ALL STATIONS: DISTRESS, DISTRESS. JUST COLLIDED WITH ANOTHER SHIP. WE ARE TOO BENDING, IMPOSSIBLE TO PUT LIFEBOATS AT SEA. 10:21 PM ROBERT E. HOPIKINS TO ANDREA DORIA: YOUR DISTRESS MESSAGE ACKNOWLEDGED. PLEASE STAND BY FOR OUR POSITION. Ray Maurstad was a young radio officer on the tanker Robert E. Hopkins when he was the first to reply to the SOS from the sinking luxury liner Andrea Doria on July 26, 1956. Except for the sinking of the Titanic, the tragedy was one of the most spectacular in marine history. The Doria was the pride of the Italian line when she collided with the Swedish liner Stockholm off the New England coast. The Stockholm survived; the Doria sank and 51 lives were lost. "I believe good, fast communications were responsible for saving the lives of the other 1,655 passengers and crew," sayd Maurstad, who is now Director of Product Planning and Operations for the Peripherals Division in Blue Bell, PA.
"Indeed, other ships reached the Doria so swiftly and skillfully that it was an epic rescue as well as a nightmare of fear." "That SOS was the most terrifying sound I ever heard," he recalls. "I could visualize the whole thing--all those people in the water about to drown, frantic for help." "We were the fourth ship to arrive at the scene although we were only 45 miles away. We were delayed by having to go around fishing vessels." "As we approached the Doria through the fog, we could see she had a heavy starboard list and looked as if she might capsize any moment." "We picked up the last passenger off the ship. He was hangin on the stern, stark naked, hollering for help." "He had been partying and was asleep in his cabin, unaware the ship was sinking. When he awokle, he had to crawl up the bulkhead wall, using the sink and towel racks, to reach the passageway." 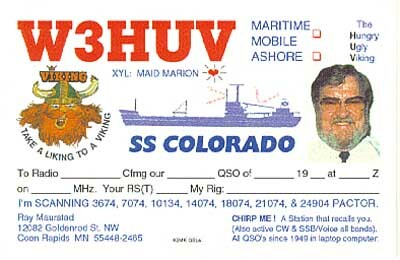 That wasn't the first time radio communications figured prominently in Maurstad's life. In June, 1950, he was on assignment to establish a Merchant Marine academy in Pusan, Korea. It was Sundy morning and Maurstad was relaxing at his ham radio, chatting with a friend in Seoul. The casual conversation abruptly became extremely urgent as Maurstad was informed that a large force of North Koreans had crossed the border and was invading South Korea at Seoul. This attack signalled the start of the Korean war. Maurstad relayed the new to Gen. MacArthur's headquarter in Tokyo. For the next two week, until they were evacuated to Japan, he and another ham operator manned the radio around the clock. I have been in contact with Mr. Hudson; the man we rescued off the stern. I have a 1- hour presentation of overhead slides and ten large display posters of Doria/Stockholm pictures. I have made the Doria/Stockholm presentation all over the country; especially to radio groups who have an avid interest in those distress communications. I converted my original radio log from morse code to plain language...depicting all of the communications between the Doria, the Stockholm and all rescue vessels. Most outstanding was the action of the Ile de France.